Hey everyone! Did you all have a grand weekend? 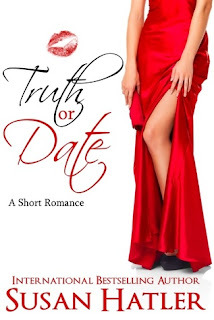 I kicked my weekend off with this book, Truth or Date by Susan Hatler. Friday night, it's late and very quiet at my house. I'm curled up in bed reading a witty, fun, romantic book. Perfect, right? I really needed a good light-hearted distraction. I was in the mood for a romance because I've been reading lots of dystopian and paranormal lately. (which I also enjoy, don't get me wrong) A clean romance is where my heart sighs though. I just can't help it. Truth or Date is the second book in a series but these books are stand alone books for sure. You don't have to read one before another to be in the loop. These are also short stories, so be aware that they will probably end way before you are ready! So, yeah, if you have a couple hours to devote to reading and you have a hankering for a good romance that will make you smile, you need to check this book out. Indulge, enjoy! My thanks to Susan for being the most awesome author friend and sending me her book to read and review. It's always a happy day to get a note in my mailbox from Susan.